Take a look at this cute image of a girl learning yoga with her mother, isn't it nice? 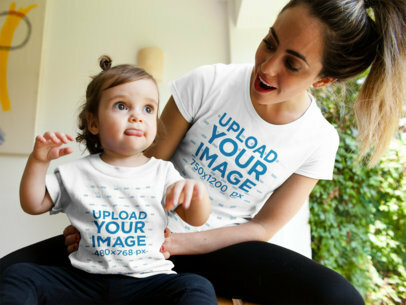 Use this mockup from Placeit and create a beautiful parents with kids image to show your latest round neck t-shirt designs in a better way. 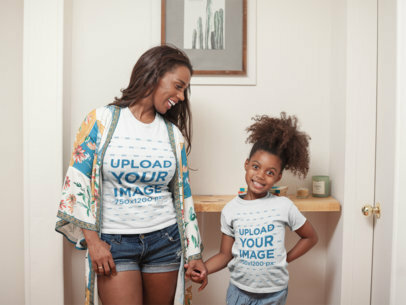 Start now using Placeit's visuals to showcase your mom and daughter tshirt designs and watch your revenue grow! 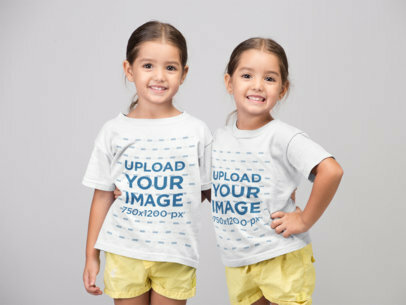 Create beautiful visuals with a t-shirt mockup featuring siblings in a studio and promote two of your kids' t-shirt designs with a really cool picture. 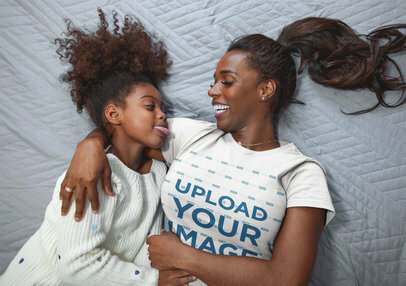 Create a beautiful visual to promote your latest round neck tees with Placeit's mockups and show your audience a beautiful image that they'll fall in love with. 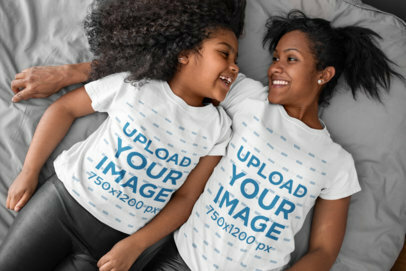 Start now using this visual of two siblings wearing tshirts while smiling and show a more photorealistic version of your design! 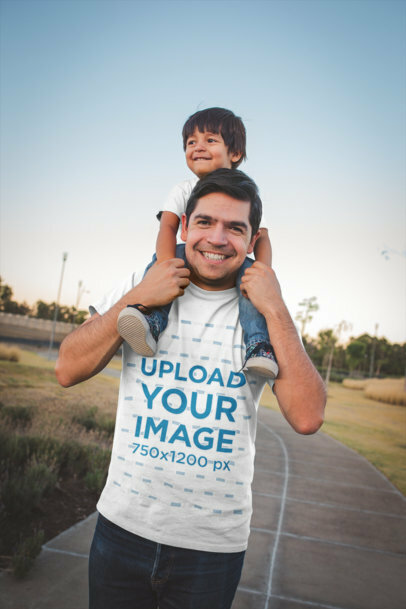 Use now this awesome mockup featuring a dad and daughter walking and wearing t-shirts at the park, it's a great visual asset that you can use if you are looking to promote your latest dad and daughter t-shirt designs! Use the HEX tool on the right to choose a color for each garment, then drag-and-drop your design image files over the upload buttons on the left. Try another T-Shirt Mockup! Have awesome t-shirt designs that you want to show off to your audience? Use Placeit's apparel Mockups! 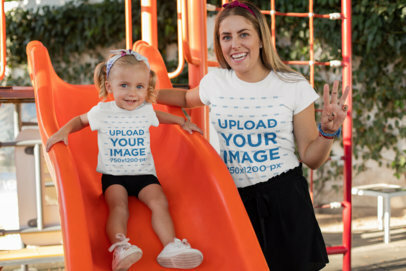 This mockup features a mother and daughter outdoors, which means you can display your parents with kids designs on both t-shirts and even change the t-shirt color! The best part of all, our mockups are easy to use and don't require any additional software. Edit your apparel mockup now. 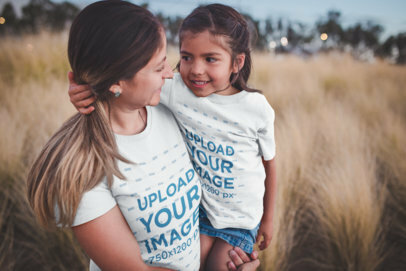 Use now this awesome mockup featuring a mom and daughter while standing against a white background, it's a great visual that you should use to promote your designs for tees in a better way! Use the HEX tool on the right to choose a color for the garment, then drag-and-drop your design image file over the upload button on the left. 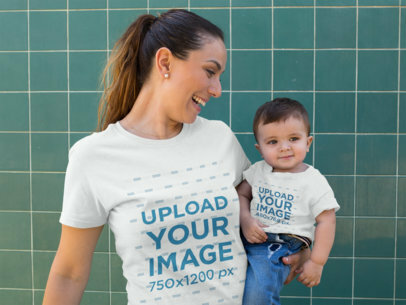 Use mockups of parents with kids and watch how your tshirt sales grow! Try another T-Shirt Mockup! 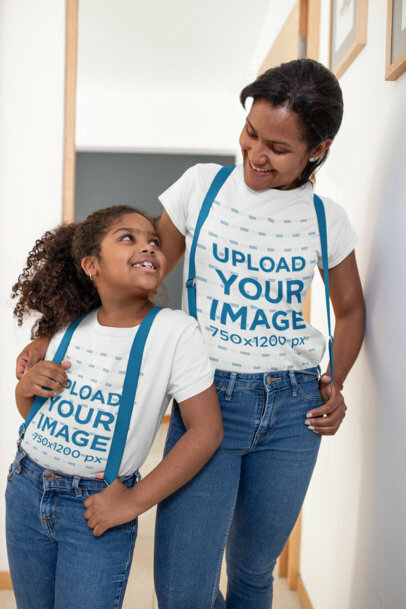 This beautiful visual of a mom and daughter wearing t-shirts while against a white wall is an excellent choice if you are looking to promote your latest designs! 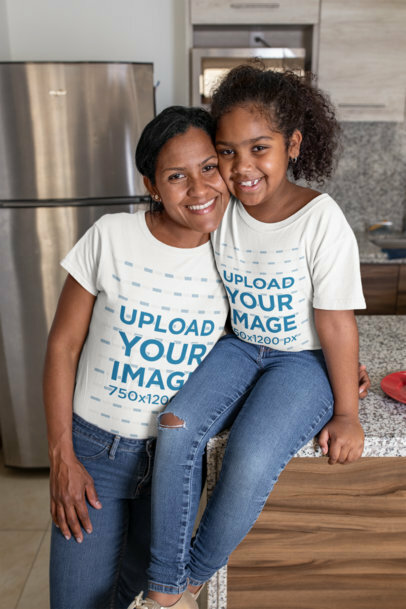 Start now using Placeit and showcase your latest designs for mom and daughter tees designs using a great image that your customers will love. 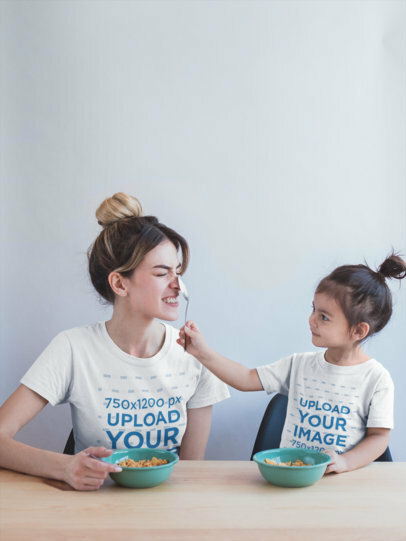 Use now this beautiful visual featuring a mom and her daughter wearing t-shirts during a fun breakfast, it's a great choice if you want to market your latest family t-shirts in a better way! Use visually appealing images to attract your audience to buy your products, they will see what the designs look like in real life with these images. Try another T-Shirt Mockup! 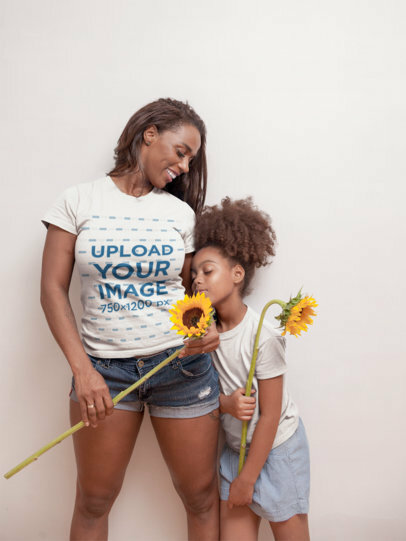 Use now this beautiful mockup featuring a mom and daughter having fun while wearing t-shirts in a photo studio and promote your designs for tees in a better way! Use the HEX tool on the right to choose a color for the garment, then drag-and-drop your design image file over the upload button on the left side of the page. 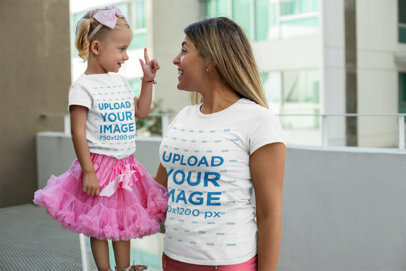 Using mockups featuring parents with kids is a great way to promote your designs. Try another T-Shirt Mockup! 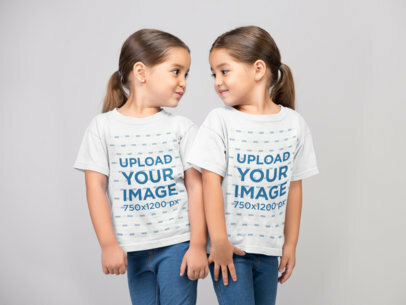 Create a beautiful mockup of two little girls wearing tshirts while in a photo studio and promote your latest designs for kids' round neck tees using an awesome image that your customers will love. 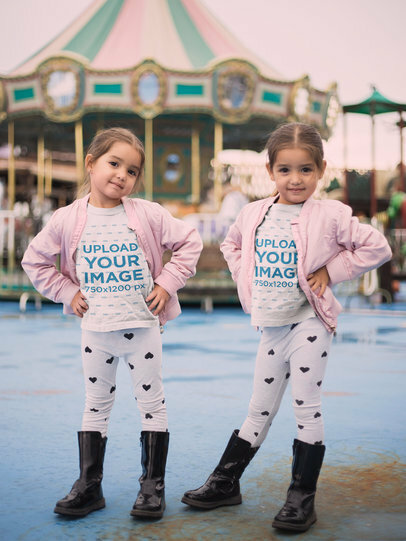 This cute image of two siblings looking at each other is an excellent choice to start showing cute sisters t-shirt designs! 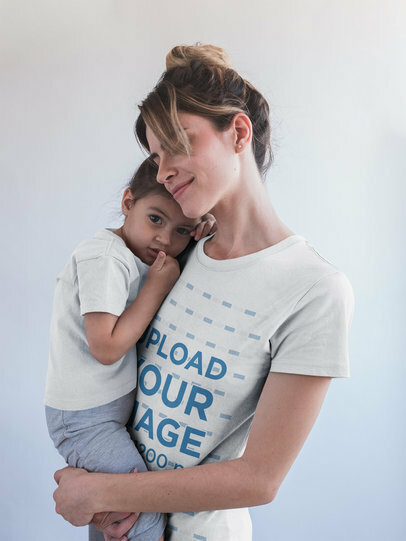 Create visuals to promote your latest designs for tees with Placeit's mockups and make your sales grow by showing realistic visuals of parents with kids that your audience will enjoy watching. 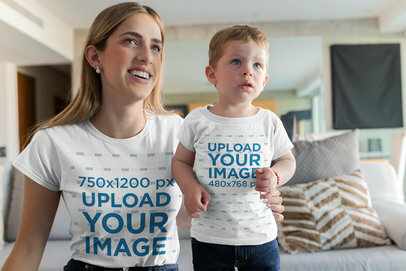 Start now using this dad and son t-shirt mockup and sell more t-shirts by showing your designs in amazing visuals! 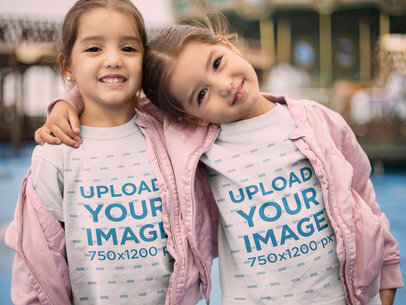 Use a beautiful mockup such as this featuring two little siblings wearing t-shirts and make your revenue grow by showing your round neck tee designs with a gorgeous image that your audience will love. 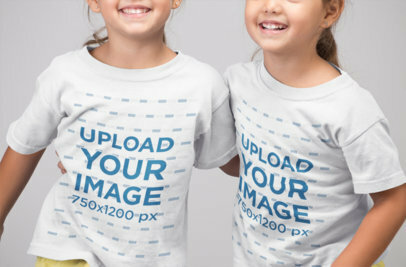 Start now using Placeit and sell more kids' t-shirts with this siblings mockup! 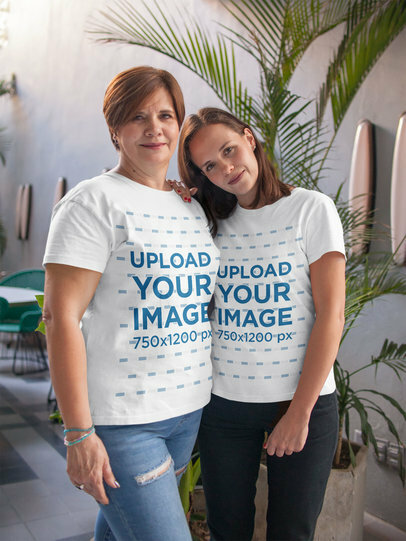 This mockup is an excellent choice if you are looking to promote your latest designs for round neck tees using a visually enticing image that your customers will surely love. 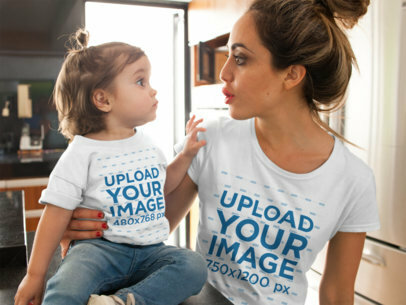 Start now using Placeit's mockups to promote your dad and son or your dad and daughter t-shirt mockups with visually enticing images. 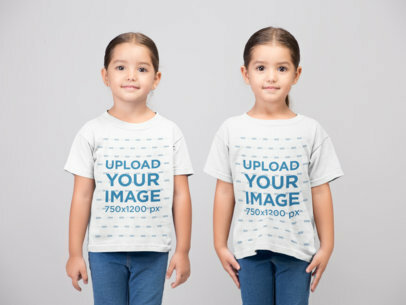 This mockup of two siblings wearing t-shirts while posing at a photo studio is an excellent choice for you to promote your latest kids' t-shirt designs! 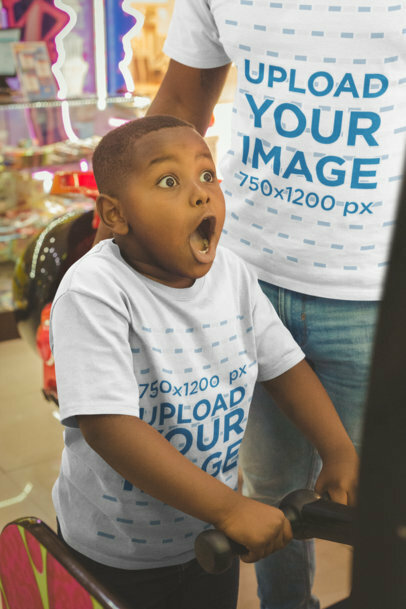 Start now using round neck tees to show your tee designs now and make your revenue grow after showing visuals that your audience will fall in love with. 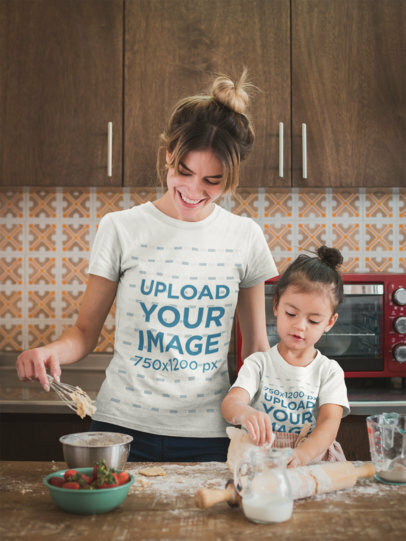 Use now this awesome mockup featuring a mom and daughter cooking while wearing t-shirts, it's a great visual that you should use if you want to promote your designs for family tshirts in a more beautiful way! Use the HEX tool on the right to choose a color for the garment, then drag-and-drop your design image file over the upload button on the left. Try another T-Shirt Mockup! 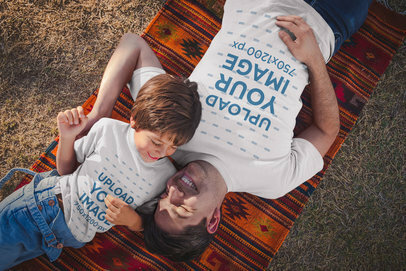 Use now this gorgeous visual asset featuring a dad and a boy wearing round neck tees while lying down at the park, it's a beautiful image that you should use if you are looking to promote your dad-and-son t-shirt designs! 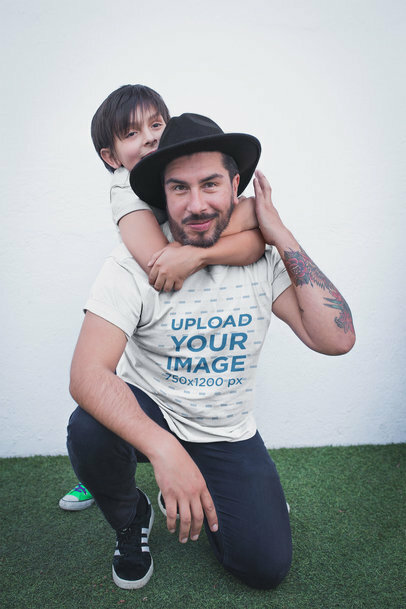 Placeit's visuals will help you market your latest dad and son t-shirt designs with gorgeous images. Try another T-Shirt Mockup! 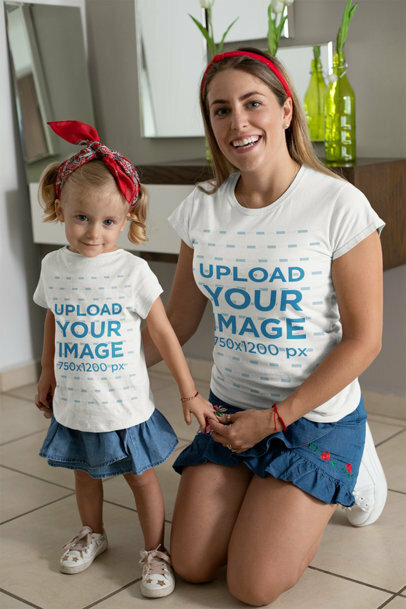 This mom and daughter mockup is an excellent image that you should use to promote your latest round neck tee designs for parents with kids! 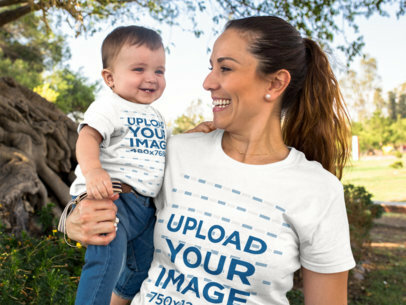 Use it now and see how your t-shirt sales grow after using an enticing image that your audience will love. 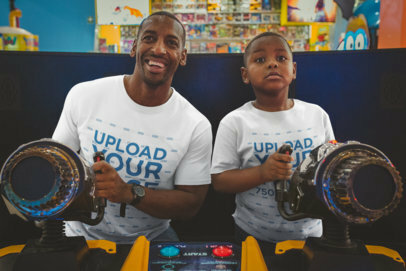 Use now this mockup featuring a dad and son wearing round neck tees while playing at the arcade and make your income grow by showing realistic images with your design on the tshirts. Start now using Placeit and make your income grow by promoting beautiful images! 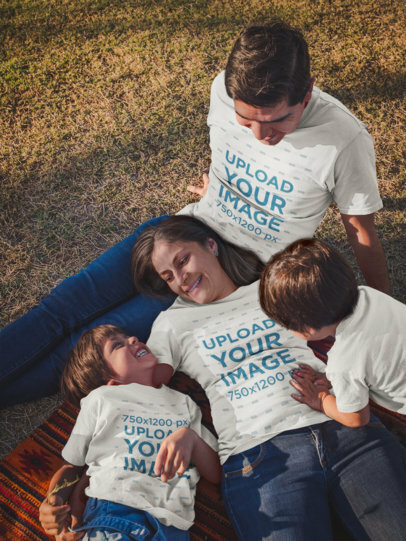 Use now this awesome mockup featuring a family of four wearing t-shirts while at the park, it's a gorgeous image that you should be using to promote your latest designs for tees in a more photorealistic way! Use the HEX tools on the right to choose a color for the garments, then drag n' drop your design image files over the upload buttons on the left. Whether you are selling mom and son t-shirt designs or dad and son tshirt designs, this image is perfect for you! Try another T-Shirt Mockup! Check out this cool mockup from Placeit, it's a really cool visual that'll help your business grow! Promote several designs at the same time with this mockup. Change the color of each tee with the menu on the right, upload a different image for each with the menu on the left! Each change will take us a couple of seconds to apply. Isn't it great? 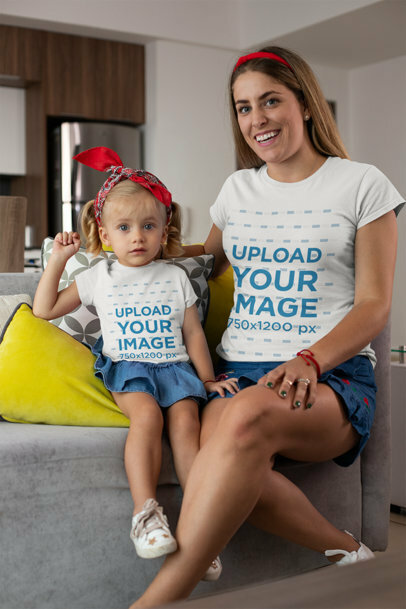 If you want to promote dad and daughter t-shirt designs or mom and son tshirt designs, this template is great for both cases! Try another T-Shirt Mockup here! Placeit's mockups are the best option if you are looking to give your brand's marketing a boost. 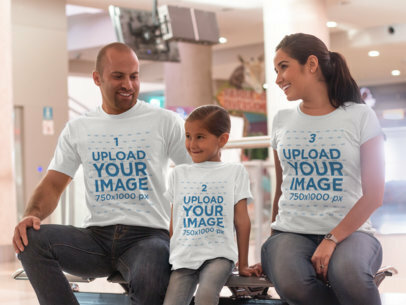 Take a look at this one, featuring a dad and daughter being accompanied by the mom while wearing tshirts with different designs while at the mall, it's a beautiful image! 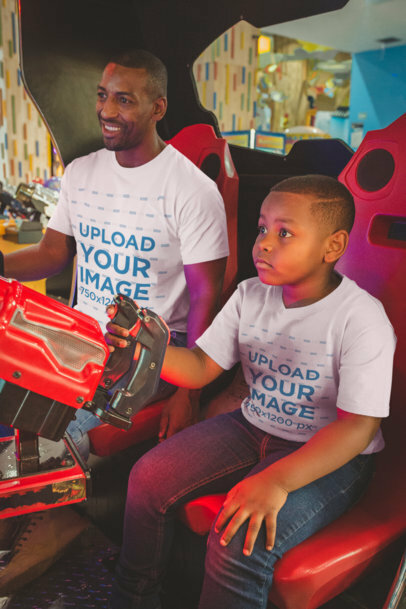 Use it now and boost your sales, upload a design for each tee with the menu on the left, and change the tees' color with the menu on the right. Start now and sell more tees! Try another T-Shirt Mockup here! A man is standing outside on a sidewalk. He's carrying a child on his shoulders. He's wearing a t-shirt and jeans. His hair is neat and short. He and the child are smiling. The weather is nice, and it is daytime. 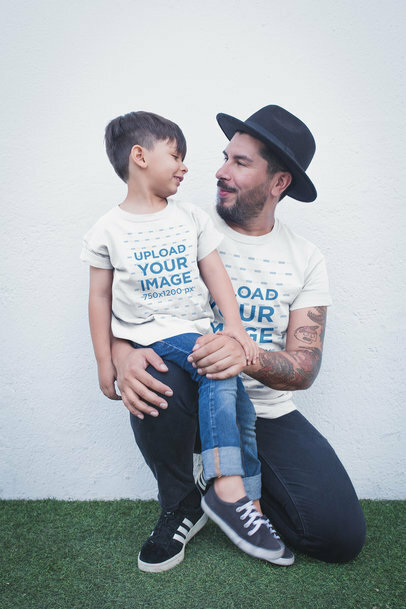 Use a parents with kids mockup featuring a dad and son walking outdoors and promote your t-shirt designs with cool visuals! 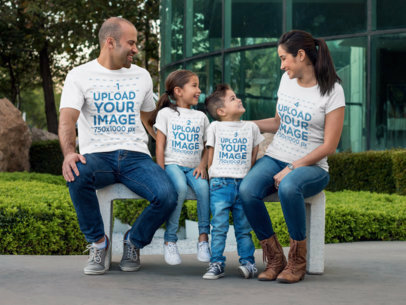 Check out this mockup of a family of four having a reunion at a restaurant, it's a gorgeous visual that will help you boost your parents with kids' t-shirts! 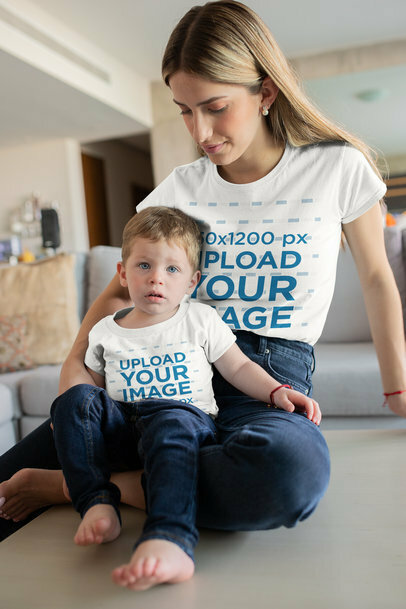 Whether you are looking to promote mom and son t-shirt designs or dad and daughter tshirt designs, use this mockup and start selling more! Use the menus on the sides to change the tees colors and upload your designs. Try another T-Shirt Mockup here! 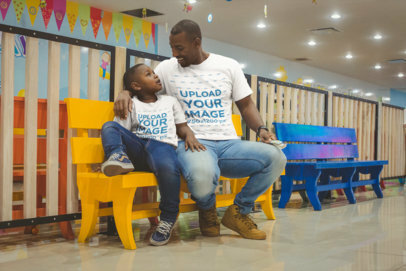 Use this awesome paternity t-shirt mockup featuring a dad and a daughter wearing different round neck t-shirts and market your latest family t-shirt designs in a more beautiful way! Use the HEX tool on the right to choose a color for each tee, then drag-and-drop your designs image files over the upload buttons on the left. Try another T-Shirt Mockup!